I’ve had a number of people tell me that they like my Valentine’s Day post, but many of them did not solve the Excel Spreadsheet. That’s the most important part of the post! You have to see what happens to Mr. Lovr! There’s no set-up necessary; just open Excel Solver (it’s an add-in you have to enable in Windows and a separate program in the Mac), and click on the “Solve” button. You’ll be glad you did. He also remembers that because the total supply is equal to the total demand, he can write all of the constraints in this problem as equalities. Essentially, he has to say that, for each flower shop, the number of bouquets that it ships has to be equal to the number of bouquets that it has. 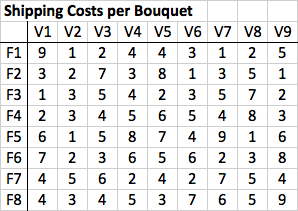 Similarly, he needs one constraint for each valentine saying that the number of bouquets that they receive has to be equal to the number that they want (according to his estimates above). To avoid suspicion, he also decides that it’s better for each flower shop to send no more than one bouquet to the same person. So far, so good, but he needs a specific shipment plan because he’s running out of time. Thanks to my love for giving me the idea for this blog post.